Enjoy a sizzling soak along the newly formed Colorado Historic Hot Springs Loop. 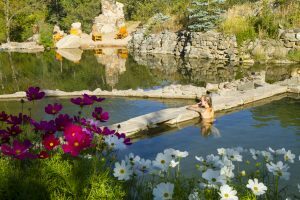 In addition to its many incredible ski resorts, Colorado is also home to a number of hot springs—the perfect complement to a thigh-burning day on the hill (or for a romantic weekend getaway). 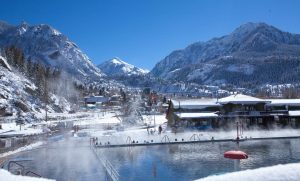 Five premier Colorado hot springs destinations—Chaffee County, Pagosa Springs, Ouray County, Glenwood Springs and Steamboat Springs—recently came together to form the Colorado Historic Hot Springs Loop. 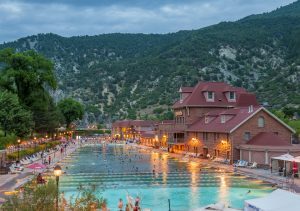 This 722-mile route follows some of the Colorado Scenic Byways, showcasing 19 diverse hot springs facilities. From intimate private baths and vapor caves to hot pots, terraced pools and enormous travertine formations, each is a unique geothermal experience. (Note: Usually a swimsuit is required, but not always.) And if you can’t decide on just one, make a week of it and hit all 19. Soaking in super-heated water saturated with minerals has long been known to offer a number of benefits. Practiced for thousands of years, balneology (the art and science of baths and bathing in natural mineral waters for health and wellness) helps to revitalize the skin, calm nerves and detoxify the body. It has been known to reduce the symptoms of arthritis, fibromyalgia, depression, as well as locomotor and circulatory diseases. It’s also the ultimate in relaxation. Start from any of the five resort towns, and take a week to 10 days to truly experience these special places. From Denver, begin the trip in Chaffee County with the communities of Buena Vista, Nathrop and Salida along the Top of the Rockies and Collegiate Peaks byways. Then travel 140 mountainous miles south to Pagosa Springs. After weaving through the San Juan Skyway and the Million Dollar Highway, your next stops will be Ouray and Ridgway. Then follow along the West Elk Loop, which traverses 175 miles through wine country, fruit stands, orchards and organic farms on the way to Glenwood Springs. Finally, travel 114 miles along canyons and ranch lands to Steamboat Springs. Here’s a rundown on each of the five hot springs destinations—and the 19 hot springs facilities—in the loop. Chaffee County is home to the Collegiate Peaks—the range of 14,000-foot mountains—which is the highest number of 14ers in any Colorado county. Summer visitors enjoy whitewater rafting and kayaking down the Arkansas River, while winter guests seek out skiing on Monarch Mountain. Regardless of the time of year, be sure to check out the number of hot springs resorts here. Outside of Buena Vista, Mount Princeton Hot Springs Resort is a full-service retreat with five 100-percent natural geothermal pools (each odorless and offering a unique twist with temps ranging from 75-107F), a 400-foot waterslide that connects the upper pools by a lazy river, a spa and club (offering yoga and fitness classes), 30 log cabins and more than 40 hotel rooms. Be sure to wade into Chalk Creek to access the natural hot pots. The rock-lined pools at the Cottonwood Hot Springs Inn & Spa, surrounded by the San Isabel National Forest, first opened in 1878. Here you’ll find everything from three all-natural hot springs pools and massage therapy to a dry sauna and creek-side lodging. The hot springs, which feature odorless and pristine mineral water ranging from 94-110F, are open 365 days per year. Meanwhile, Salida Hot Springs Aquatic Center features one of the largest indoor hot spring pools in the country. Enjoy clear, aroma-free water (originally used by the Ute people for its healing properties) ranging from 84-100F in the zero-depth-entry pool, lap lanes and private baths. Or, for a completely private hot springs experience, try the cozy Alpine Hotsprings Hideaway, Antero Hot Springs Cabins or Creekside Hot Springs Cabin. Surrounded by the Weminuche Wilderness and the San Juan National Forest in Southwest Colorado, Pagosa Springs is home to the Great Pagosa Hot Springs—officially designated by Guinness World Records as the “Deepest Hot Springs Aquifer in the World.” The Mother Spring, as it is known, fuels three downtown hot springs locations. First stop by The Springs Resort & Spa, which features 23 mineral pools terraced along the bank of the San Juan River. Each spot offers different sizes, designs, views and temperatures ranging from 95-112F. The resort also boasts a 79-room hotel with five additional private soaking tubs and a full-service day spa. For a hip vibe, go to Overlook Hot Springs Spa in the heart of historic downtown Pagosa Springs, and discover the ornate architectural moldings and soaring ceilings surrounding the 15 large soaking tubs (ranging from 98-104F). The rooftop tubs overlooking the San Juan Mountains and river set this spa apart from all others. Guests also will enjoy complete massage services, a private tub room available by the hour, and wine and beer options available for purchase while soaking. Healing Waters Resort & Spa is also located downtown within walking distance of shops, restaurants and recreational activities. With a large pool (ranging from 97-104F), outdoor hot tub and European-style indoor hot bath facilities with steam rooms and benches, this is a great place to simply relax. The resort also features 15 hotel rooms, three cabin options, and a spa offering a variety of massage and body treatments. Once you arrive in Ouray, with its brightly painted Victorian buildings lining Main Street and lodges that resemble chalets, you’ll understand why it is often referred to as “the Switzerland of America.” It’s also the Jeeping Capitol of the World, and the Ouray Ice Park offers the best ice climbing in Colorado. Ouray and Ridgway both have charming downtown districts that are filled with locally owned shops, breweries, coffee roasters, chocolatiers, restaurants, performing arts venues and more. When it comes to hot springs, try the iconic Ouray Hot Springs Pool & Fitness Center that opened in 1927 with pools ranging from 78-106F. The resort features a pool with close to one million gallons of crystal-clear, odorless hot springs water; water slides with splash pads; an overlook with terraced pools and an infinity edge waterfall; a massage and fitness center; and an activity pool with a Wibit inflatable obstacle course with a 12-foot climbing wall and a 6-foot jumping platform. Ouray Hot Springs recently completed a $10.6 million renovation, just in time for its 90th anniversary. One of the many goals of this project was to make the hot springs more accessible, secluded,and inclusive for all visitors, while maintaining the pool’s historic oval shape. Meanwhile, the Historic Wiesbaden Hot Springs Spa & Lodgings sits atop a vapor cave where water pours over a large mineral deposit formation into a shallow soaking pool deep inside an underground chamber. There’s also an outdoor swimming pool and private outdoor spa, all heated with geothermal water. For complete solitude, be sure to rent the Lorelei outdoor enclosure. Then there’s Box Canyon Lodge & Hot Springs, which features four redwood spas terraced on the mountainside. The tubs, elevated by a deck and surrounded by a flowered landscape, makes for a private, guest-only soaking experience. And at Twin Peaks Lodge & Hot Springs, guests will enjoy a quiet and relaxing atmosphere with heated mineral pools, lush landscaping, a fire pit and an intimate waterfall. In nearby Ridgway, Orvis Hot Springs is famous for its clothing-optional policy—several ponds and waterfalls are strategically positioned throughout the property (all open 24 hours per day, meaning it’s an ideal stargazing spot) for this reason. There are four outdoor soaking pools; two indoor private pools and one shared space; six remodeled, Victorian-inspired lodging rooms; elegant outdoor yurts for massages; on-site tent and vehicle camping; and a policy disallowing the use of electronics. Glenwood Springs is home to a number of distinctive attractions. For starters, be sure to pay homage to Doc Holliday—the dentist/gunslinger who used to frequent Glenwood Springs to treat his tuberculosis—by sipping a beer under the Doc Holliday Saloon neon gun sign. Meanwhile, the mountaintop Glenwood Caverns Adventure Park combines spectacular cave tours and thrilling rides with panoramic views. During the warm weather months, rafting the town’s two rivers, hiking to Hanging Lake, and biking along paved and unpaved trails are popular activities. In winter, skiing, snowboarding and snowmobiling are on the itinerary. Of course, there’s also a number of hot springs that should be on your must-visit list. At two blocks long, Glenwood Hot Springs Pool—established in 1888—is considered to be the world’s largest mineral hot springs pool and it a glorious 104°F. The source, the Yampah Spring, flows at 3.5 million gallons of water daily. 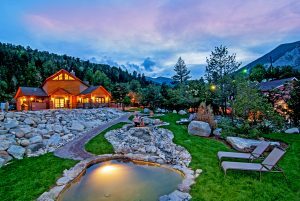 The award-winning Spa of the Rockies and the 107-room lodge are geothermally heated. There’s also two water slides, a diving board, an athletic club, a restaurant and a retail store. The new Iron Mountain Hot Springs is situated along the Colorado River with 16 naturally shaped soaking pools that vary in temperature (99°F to 108°F) and size. Smaller thermal spring pools are surrounded by a quiet zone to enhance relaxation, while a large family freshwater pool sits at 90°F near a jetted spa. The views here can’t be beat, and other amenities include the Sopris Café, the Sand Bar (beer and cocktails are available after 2 p.m.), a retail shop, massage therapy and a bathhouse with free lockers. Yampah Spa & Vapor Caves has naturally occurring mineral steam baths — a rare underground feature — created by thermal spring water flowing through the cave floors via narrow channels at a simmering 125°F. The Ute Indians used the vapor caves for purification rituals when they inhabited the area. Pair a steam in the vapor caves with an herbal body treatments at the spa or a mineral bath for a truly relaxing experience. Steamboat Springs is a mecca for outdoor activities and adventure, with everything from tubing, rafting, fly-fishing, boating, motorized water sports, swimming, canoeing, skiing and soaking. 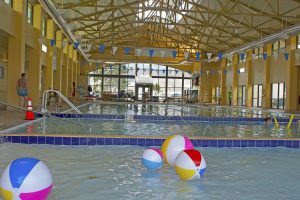 The Old Town Hot Springs is a multi-use complex that’s been open since 1935 with numerous hot pools, an eight-lane lap pool, two waterslides, an aquatic climbing wall, two tennis courts, massage therapists and a fitness center. Party decks and cabana rentals in the summer up the ante on the soaking experience. Finally, for a rustic wilderness setting, soak at the creekside Strawberry Park Hot Springs. The facilities are nestled in an aspen grove and were built using unique stone masonry. Here, you’ll enjoy a unique, intimate-with-nature soaking experience, alongside tipis, picnic areas and the flowing Hot Springs Creek. Book a stay in a secluded cabin or campsite right on the property.